The Trans-Pecos, as originally defined in 1887 by the Texas geologist Robert T. Hill, is the portion of Texas that lies west of the Pecos River. The term is considered synonymous with "Far West Texas", a subdivision of West Texas. The Trans-Pecos is part of the Chihuahuan Desert, the largest desert in North America. It is the most mountainous and arid portion of the state, and most of its area (outside the city of El Paso) is vast and sparsely populated, comprising seven of the ten largest counties by area in Texas. 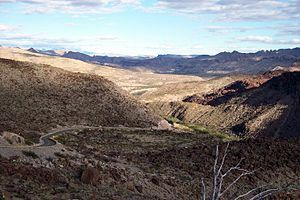 The area is known for the natural environment of the Big Bend and the gorge of the Rio Grande, part of which has been designated a National Wild and Scenic Rivers System. 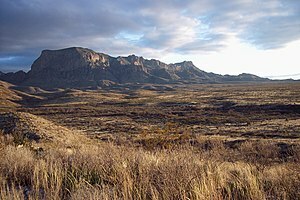 With the notable exceptions of Big Bend Ranch State Park, Big Bend National Park and the Guadalupe Mountains National Park, the vast majority of the Trans-Pecos region consists of privately owned ranchland. However, the majority of the region's population reside in the El Paso metropolitan area. Of its nine counties, Presidio is the most consistently Democratic, being like South Texas the longest-established Democratic stronghold in the nation. El Paso has also been solidly Democratic since Ronald Reagan won the county in 1984. Jeff Davis is the most Republican county in the region, last being won for the Democratic Party by Jimmy Carter in 1976, although even George W. Bush’s 66.79 percent of the vote in 2000 stands modest compared to the 90 percent or more Republican vote common in Panhandle counties since the turn of the millennium. Hudspeth, Pecos and Terrell Counties, last won for the Democrats by Bill Clinton in 1996, have become comparably Republican to Jeff Davis in the past couple of elections. The remaining three counties, especially Brewster County, have been “swing” counties since the 1970s, although Hillary Clinton consolidated Democratic majorities in Culbertson and Reeves counties in 2016. The city of El Paso and its environs form Texas's 16th congressional district, currently represented by Congressman Veronica Escobar (D-El Paso). The remainder of the region is located entirely within Texas's 23rd congressional district, currently represented by Congressman Will Hurd (R-Helotes). In the Texas Senate, El Paso County forms a single district, Senate District 29, represented by José R. Rodríguez (D-El Paso), while the remainder of the region is included in Senate District 19, represented by Pete Flores (R-Pleasanton). In the Texas House of Representatives, El Paso County is divided between House Districts 75-79, while the remainder of the region is included in House District 74. "Trans-Pecos Geology Resources". Walter Geology Library. University of Texas at Austin. Archived from the original on 2010-06-10. "Trans Pecos Mountains & Basins". Texas Beyond History. University of Texas at Austin. This page was last edited on 20 March 2019, at 20:57 (UTC).